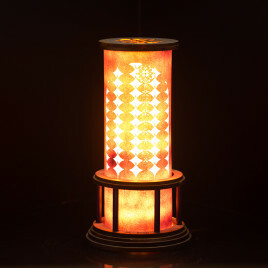 This lamp provide a warm glow that creates a beautiful accent to any room. The pattern shown is inspired by a Giant Allium blossom, an intricate flower made up of many smaller buds. The marbled colors shift dramatically when lit vs unlit, where the solid colors remain far more true to their outside appearance, even when lit up. 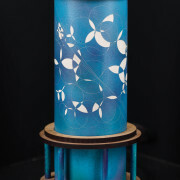 Made from 140# watercolor paper with a beetlkill pine wood base, this lamp will be sure to delight! Available in a nearly infinite color options, let your imagination go wild! Custom patterns and woods also available, just get in touch. Like to switch things up? The paper insert is easily replaceable and can be bought separately, giving you a truly versatile lighting option. See separate listing for paper inserts. Ships in parts with instructions for assembly. Available pre-assembled for $10 extra. 10.5″ high by 5″ round at the base. 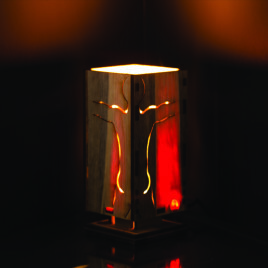 This lamp provide a warm glow that creates a beautiful accent to any room. The pattern shown is inspired by a Barrel Cactus, an intricate network of ribs and spikes found in the Sonoran Desert. The marbled colors shift dramatically when lit vs unlit, where the solid colors remain far more true to their outside appearance, even when lit up. 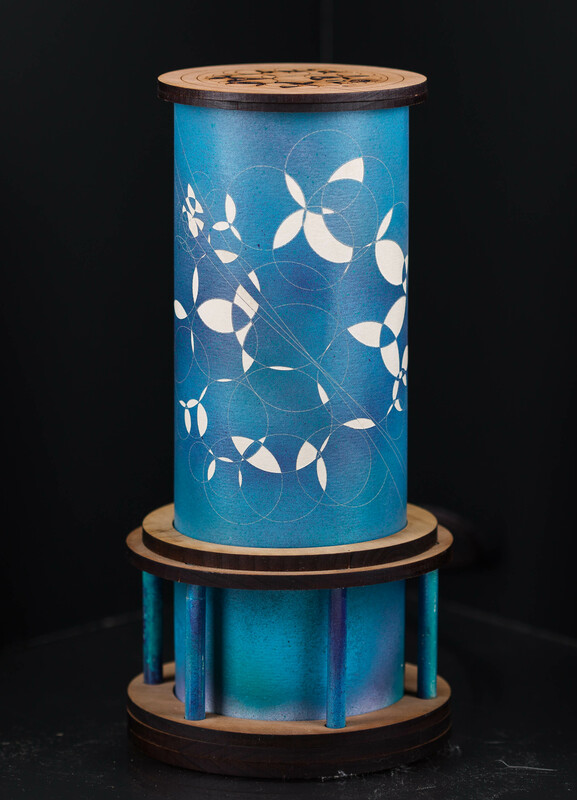 Made from 140# watercolor paper with a beetlkill pine wood base, this lamp will be sure to delight! Available in a nearly infinite color options, let your imagination go wild! Custom patterns and woods also available, just get in touch. 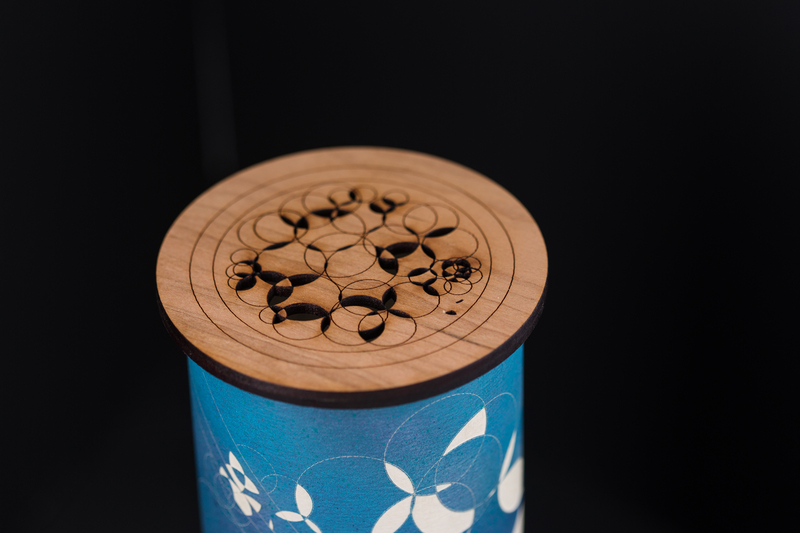 Laser cut from waste wood, this unique table lamp was designed for an art exhibit celebrating the human figure. With female and male silhouettes reaching across to each other, this lamp is a lovely accent to any home. This lamp can also provide a wonderful, soft glow for chiropractic, massage therapy and health service offices. Prefer male/male or female/female? Just ask! 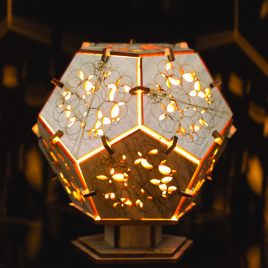 This unique laser cut dodecahedron lamp has an original pattern inspired by a Giant Allium flower. 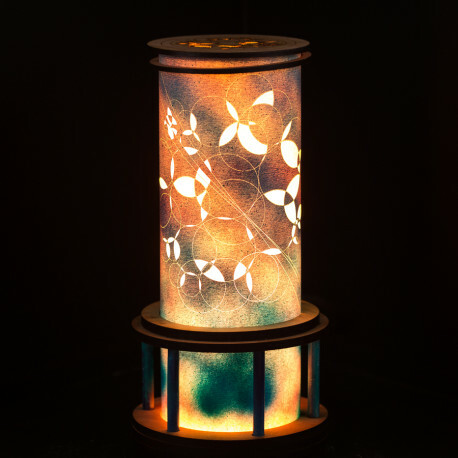 When lit, this lamp casts amazing patterns across your space and is a perfect accent or night light. Made from Beetlekill Pine wood, the lighter, figured portions of the wood glow through with a warm orange hue. Knots in the wood have a fiery appearance. Each lamp is made to order, with carefully selected pieces for dynamic and unique affects. No two lamps will be exactly alike. 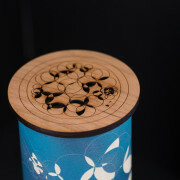 This unique table lamp has patterns inspired by the Aloe blossom. 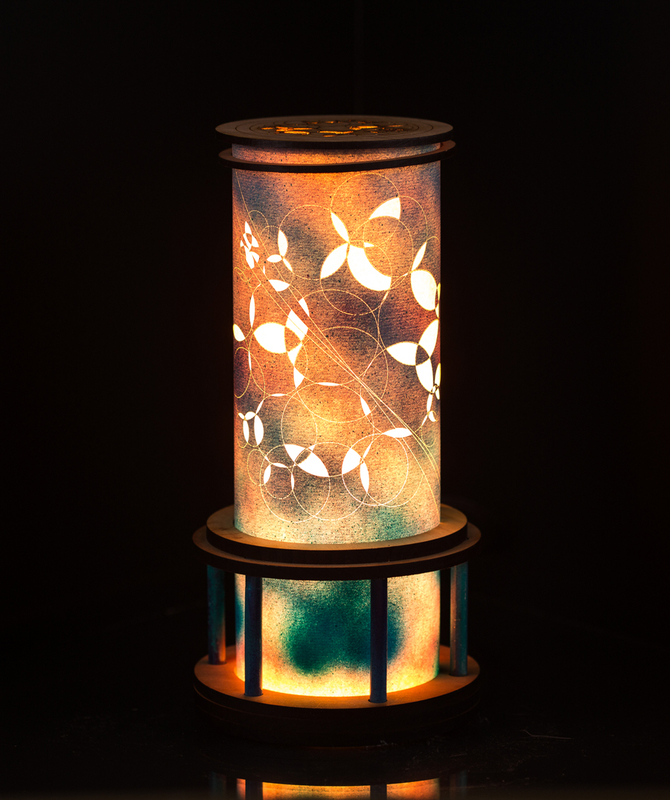 The intricate geometries that make this lamp extra special are directly connected to the natural patterns of growth and death inherent to a vibrant Aloe blossom. 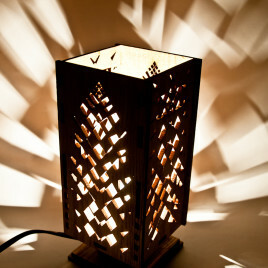 When lit, this lamp casts amazing patterns across your space and is a perfect accent or night light.